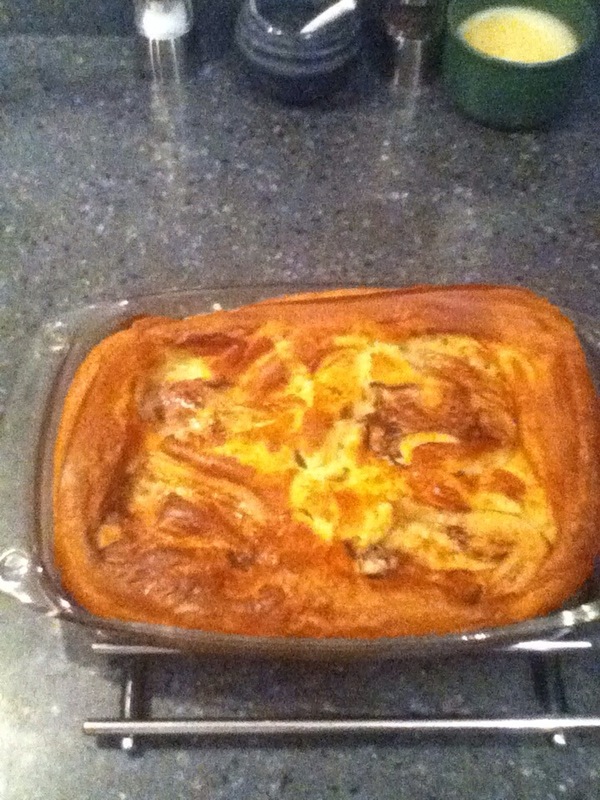 Here is a little twist on sausage toad in the hole. You can also use this batter mix to make individual Yorkshire puddings in a muffin tin for the freezer, so you always have them on hand instead of buying them at the supermarket and trying to get them home before they defrost! BBC1 thinks I do this because I am tight, this may be true (but I couldn’t possibly comment) although they are much better and cheaper. Sift the flour into a bowl, it is important to do this to aerate the flour and help your batter rise, add a pinch of salt and pepper, add both eggs and about 100mls of the liquid and bring the mixture together using a whisk, you should have a thick batter at this point, make sure that you mix it well and incorporate any flour at the bottom of the bowl, then slowly add the rest of the liquid while whisking (top tip place a tea towel under the bowl to stop it moving) you should now have a thin watery batter, you can now leave the whisk in the bowl cover with a tea towel and leave for a few hours if you want, but at least 30 minutes. Put a small pan onto a medium heat and add a dash of cooking oil (veg/sunflower), and sweat off the onion when it starts to caramelise add the carrot and celery stirring to ensure they don’t burn just colour, now add both ketchups and coat the vegetables at this point you need to add a little of the lamb stock about 100mls to deglaze the bottom of your pan using a wooden spoon once this is done add the rest of the stock and gravy thickener bring to the boil for a minute or two then simmer while you cook the toad in the hole. Preheat the oven to 220c Fan – the oven needs to be hot! In an ovenproof dish/roasting pan (30cm/12inch x 20cm/8inch approx’) put the lard or oil and place in the oven to heat, meanwhile whisk the batter to aerate it, it may look a little grey on the top if it has been standing for a while but don’t worry with a whisk it will be refreshed. After about 5 to 10 minutes the dish should be very hot, have your batter mix and ready to hand as when you take the dish out of the oven it will start losing its heat, place the chops in the dish, one in each ¼ of the dish away from the edge, pour the batter mix into the dish avoiding the chops and place back in the oven as soon as possible and do not open the oven for the next 30 minutes or until the batter has risen and set. Cook for 10 minutes and then turndown the oven to 180c and cook for another 30 minutes or so until golden brown, to check if the batter is cooked though stick a skewer into the centre and it should come out clean, if not leave until it does. The gravy should now have thickened remove the vegetables and your ready to go, we serve it with boiled potatoes and peas. BBC1 here! I love this dish. 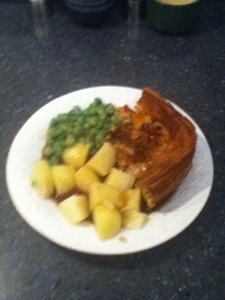 The chops give the batter such a good flavour and the gravy is great with it and the boiled potatoes and peas. More lovely comfort food. Oh and by the way…BBC2 is so tight he squeaks! But hey in these money conscience and difficult times that’s a very good trait to have! Tags: comfort food, gravy, lamb, lamb chops, lamb cutlets, main course, toad in the hole, yorkshire pudding. Bookmark the permalink. My family have been cooking this for generations although we always cook it slightly differently. We cook the chops in the dish and add the oil for 20 mins first then add the batter covering the chops too for a further 20-30 mins. Always tastes amazing and has been a winner every time I have served it to even the most sceptical of people. It’s a great dish and you’re right all carnivores seem to love it! I like to add fresh Rosemary to the oil and lamb before adding the batter, gives a lovely added flavour! Great idea, will give that a go!